Mark Your Calendars For Pizza with A Cop! 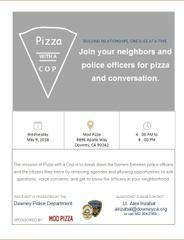 Please join the Downey Police Department and MOD Pizza in the very first Pizza with a Cop event. The event will be held at MOD Pizza located in the Downey Promenade on Wednesday, May 9th from 6PM-7PM.